The Realm Adelaide build is moving at a fast pace, with demolition soon to be complete and the works moving into excavation phase this month. Since construction started in late September, Maxcon have been working around the clock to demolish the site in preparation for excavation. 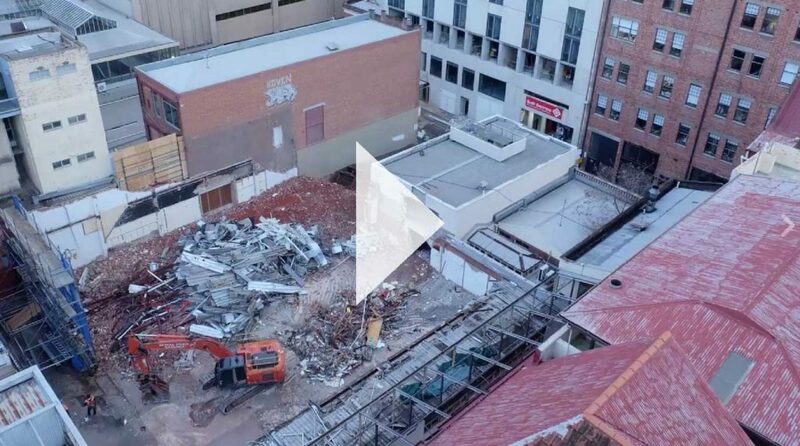 A portion of the Renaissance Arcade and some buildings along Austin Street have been demolished. Please view the time-lapse video above to see the construction progress to date. As construction continues, our display suite will remain open at 170 North Terrace to give you the opportunity to see the unparalleled interiors and style that will feature in Adelaide’s most luxurious residential tower. Realm Adelaide launched in February earlier this year and has been embraced by the local market with more than 80% of the building sold over the nine-month period, leaving only 62 apartments left for sale. Buyers are encouraged to get in quick to avoid disappointment.